Rue d'Orleans is a major route in Elbeuf, a suburb of Rouen. Orleans and Rouen are major and ancient French cities. It is made from vitreous enamel fused onto sheet steel. Heavy gauge - unlike modern versions this one can't be bent easily. Convex (domed) with the lettering and piping in relief. They really don't make any like these today. This is the real thing from real France. Not a copy, not made yesterday. All items accurately described - I do not try and mislead customers by applying euphemisms such as "authentic" or "traditional" or "original" or "vintage" or "style" to pass off cheap repro items as the real thing. Please see my other listings if you like French signs and numbers. 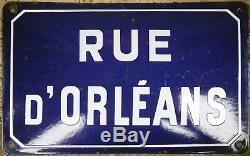 The item "Old blue French street road sign plaque plate enamel name Orleans Elbeuf Rouen" is in sale since Friday, May 25, 2018. This item is in the category "Antiques\Architectural & Garden\Signs & Plaques". The seller is "frantique2000" and is located in Yorkshire. This item can be shipped worldwide.